Whether you're considering forming a new team (we're currently accepting new league teams/Captains! ), getting ready to captain your first season, or going on your 5th championship, we know firsthand that as a Captain, it takes time and patience to manage your team. And we want you to know we're here to help make it as easy as possible, allowing you to focus on a fun and winning season! Below we've outlined how to pay your team dues, manage your team, and find players. 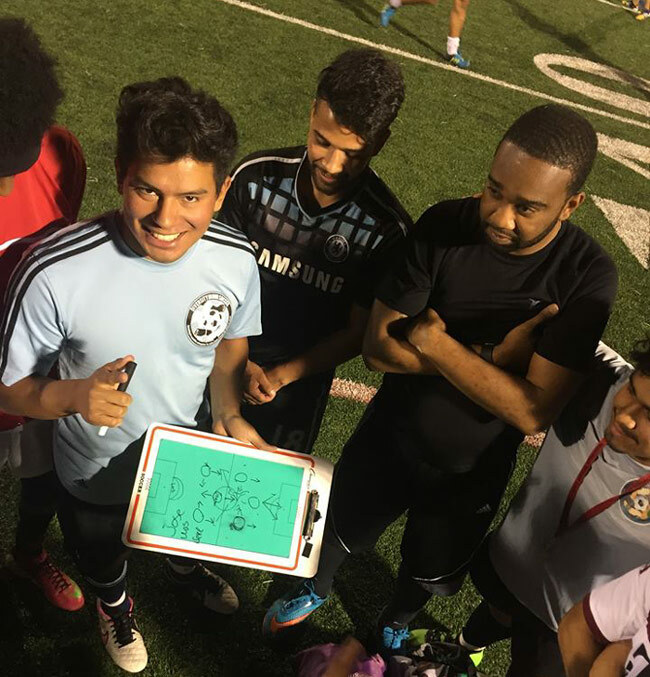 Want to switch your team to SOPFC from another Atlanta soccer league? Join the crowd! Email info@sonsofpitchesfc.com for a first season discount up to $100. To register your team each season, browse our upcoming seasons and click "Team" to sign up as a Captain. 1. The Captain's credit/debit card info is required to register a team for the league, but won't be charged right away. 2. A minimum of $150 must be paid toward a team's dues by the Signup Deadline (or 6 days prior to the scheduled start date, whichever comes first) to confirm a team's spot. This amount can be paid online by teammates, the Captain, or a combination. After registering, we encourage Captains to immediately begin inviting players to join their team and issuing them invoices for their share of team dues. After the Signup Deadline (or 6 days prior to the scheduled start date, whichever comes first), any unpaid amount of the $150 minimum will be automatically charged to the Captain's credit/debit card. 3. The full team balance must be paid by the Payment Deadline (typically the day before the second or third game). Again, this amount can be paid online by teammates, the Captain, or a combination. After the Payment Deadline, any unpaid amount of the full team balance will be automatically charged to the Captain's credit/debit card. Captains are 100% responsible for making sure their team's dues are paid in full and on time, including the $150 minimum payment to confirm team's spot. Captains can use our TeamPayer tool at any time up to the Payment Deadline to invite teammates and assign them their share of dues, paid directly toward the team balance. Note that the system will only process payments up to the amount of the team balance. So if 15 invoices for $60 are sent out on a $590 balance, the system will only process the first 9 people to pay at the full $60 price ($540 total), and the 10th person will only be charged $50 out of $60 ($590 total). Teams with delinquent dues unable to be charged for any reason will incur a $50 fine per week, and may incur game forfeits. Teams dropping out of, or disqualified from a league will forfeit their deposit and dues. In order to retain any early registration discount, a team's dues must be paid in full by the Signup Deadline (or 6 days prior to the scheduled start date, whichever comes first), otherwise the team balance will increase to the regular price and a team will then have until the Payment Deadline to pay in full. Note that in order to give Captains maximum payment flexibility, full remaining team dues will NOT be automatically charged on the Signup Deadline - Captains must pay off any remaining balance on their own by logging in to their Player Page and using the "Pay Now" button. 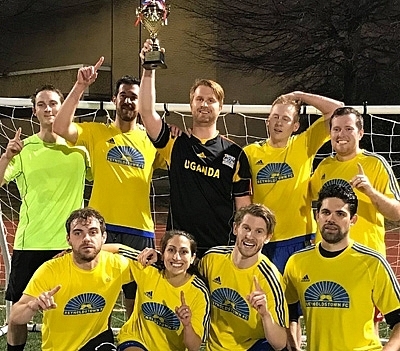 Many teams in our leagues are able to have all or part of each season's dues paid by local bars, restaurants, or businesses by securing sponsorship, in exchange for things like agreeing to have post-game social gatherings at that establishment, naming their team after the establishment, wearing jerseys with the business's logo/name, and having their business featured on our website (which we can work with you to do for them). We encourage our Captains to approach and make friends with local bars and restaurants in order to simultaneously defray the costs of team dues and support local community businesses! Here is an email template for Captains to use to help pitch businesses on the benefits of sponsoring their teams. All registration dues are non-refundable. A team's deposit and/or dues will be refunded only if SOPFC cancels a league entirely, or if a team is not offered a position in a league/division determined to be appropriate for the team. You may pay with a company check if it’s mailed to our office or delivered to an SOPFC staff member at the field (you must contact us to arrange this first - do no just show up unannounced at the field with a check). Printable invoices/receipts are available by logging in to your Player Page and clicking "View Invoice" if you need documentation to provide to your company, partner, or sponsor for reimbursement. We do not accept personal checks. Below are some common questions and methods for managing your team each season. How do I add players to my team roster online? Log in and click "Manage Team". Click "Invite Players" to add or invite teammates to your roster via email, a team invite link, or using previous season rosters. 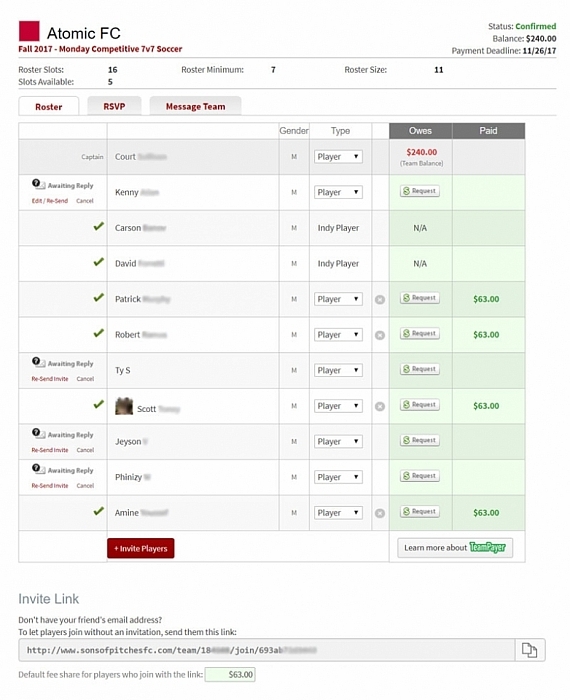 Click "Recruit Free Agents" to invite players who are looking for a team in your league. Please note: Only Captains can invite and manage players, including the ability to remove players or revoke invites they may have already sent. What are the best ways to keep track of my players? Message players directly from your Dashboard, or use your private Team Forum to communicate with teammates. Manage invites and invoices you may have issued to teammates using TeamPayer. What are the best practices for collecting money from team players? We recommend using the TeamPayer tool to invoice each of your teammates their share of team dues, paid directly to the league and lowering your team balance accordingly. Alternately, you can have your players pay you via Venmo or PayPal prior to the season start, or bring cash to the first game they play. The sooner you can secure a financial commitment from each player, the more invested they will be in showing up and contributing to the team in a positive way. When and how should I remind players of upcoming games? Players who have accepted an email invitation to join your team roster online can go to the "Profile" tab of their Player page to opt-in to receive automatic game reminders via email the day of (or Friday before) each game including the date, time, location, and links to RSVP for that game. This is another reason it's important to add all players to your roster every season! After registering your team, click the "Manage Team" button, then "Recruit Free Agents" button (below "Invite Players"). This is where you'll see a list of all players who have registered as "Free Agents" for that specific league. Click the "Invite" text link next to any players you'd like. They'll receive an email asking if they want to join your team - the email will also include your name and email in case they have questions before accepting the invite. If they accept the invite, you can then invoice them for their share of team dues, or make your own payment arrangements. Post requests for players in our "Captains & Free Agents" Facebook group, a place for players and Captains to connect. Post more about your team and league, as well as the type of player(s) you're looking for. You can also post requests for subs for specific games. SOPFC offers daily pickup games through our OpenSports group, and many of these players are looking to play in our league too. Although some players may register on their own as Free Agents, there are many players who would prefer to meet a Captain at the field and be invited directly to join a team. Playing pickup with potential players also helps you find out which players would be a good fit for your team. Ok, so you're not sure you have time to come out to play pickup and recruit players - no worries! On the OpenSports app you can message players on any event using the "Chat" tab in upper right, or click the players icon (second from bottom left) and use the sport, gender, skill level, position, and availability filters, plus player descriptions. Send a message to those players you think might be a good fit for your team and get the ball rolling! Ask friends and co-workers to play, or if they know any interested soccer players! Word of mouth is still one of the most reliable ways to recruit new players. Have your players mention to their co-workers that they're looking for another team player, or post on their Facebook to see if any of their friends might want to join. Most teams find at least 2-3 new players every season this way. Recruit players on Nextdoor, a free private social network that connects you with people in neighboring communities based on your home address. It's quick to sign up for, and each post here will reach anywhere from 2,000 to 20,000 people in your nearby neighborhoods. We know Captains who've used Nextdoor to recruit enough players over the course of a week to form a whole team, from just one post! How much do I have to pay to register my team? When do my team dues have to be paid in full? Team dues must be paid in full by the Payment Deadline, typically the day before your third game at midnight. All leagues also require a minimum of $150 paid toward a team's dues by the Signup Deadline to confirm a team's spot. When do my team dues have to be paid in full to keep the early registration discount? By midnight on the Signup Deadline for your league, listed on your league's registration page. If team dues haven't been paid in full at that point, dues will increase to the regular price and you'll then have until the Payment Deadline to pay in full. Note that in order to give Captains maximum payment flexibility, full remaining team dues will NOT be automatically charged on the Signup Deadline - Captains must pay off any remaining balance on their own by logging in to their Player Page and using the "Pay Now" button. How do I split my team balance with teammates? Use our TeamPayer tool to invite all of your teammates and invoice them for their share of team dues. TeamPayer is a way to help your teammates pay for their team fee without you having to worry about collecting cash, Venmo, PayPal, or checks. Click here for more info on TeamPayer. Is it possible I could lose my $150 minimum team payment? Yes, your team's minimum payment of $150 towards full team dues is non-refundable, secures your spot in a league, and serves as a commitment to play the season (many of our leagues have limited spots available). A team's minimum payment and/or dues will be refunded only if SOPFC cancels a league entirely, or if a team is not offered a position in a league/division determined to be appropriate for the team. My teammates stiffed me. One left town and the other paid me with expired gift cards. Can you just call them and get their money? No. Next time try using TeamPayer tool at the beginning of the season to prevent any payment issues between friends. No. Only if it’s a company check and it’s mailed to our office or delivered to an SOPFC staff member at the field (you must contact us to arrange this first - do no just show up unannounced at the field with a check). Absolutely! 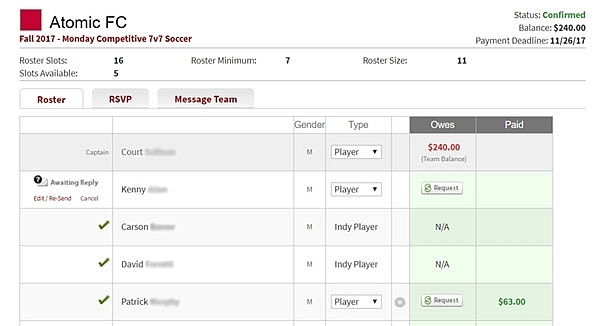 Printable invoices and receipts are available from your Player Page via the "View Invoice" text link above the "Manage Team" button. Have any questions about forming or managing your team? Read our FAQ for more information, or drop us a line anytime at info@sonsofpitchesfc.com and we'll be happy to help. Feel free to also email us if you want to share any other tips for finding players as a Captain for this page, or have any feedback for us!